Plug in the Pong-Master and your robot becomes a competitive game enjoyed by those of all ages. Can you beat the robot at Pong-Master? It’s tough. Vary the settings from beginner to world-class for an opportunity to test your accuracy, consistency, and ability to relax under pressure. Use it with the supplied targets for a fun, entertaining game or without the targets as a workout timer. The Pong-Master scoreboard is constructed of a rugged cover to protect the computer inside. It has multiple game time lengths, up to 3 sensors can be attached to the master unit for beginner to advanced training and play, and the sensors come in three different sizes. The master control unit has easily accessible game switches, such as the start and reset, large bright readout to provide optimum viewing of scores and the count down clock. Multiple Challenge Levels:Pong-Master provides multiple challenge levels to provide all players a different skill level challenge. Individual Game Minutes: Each skill level has a game time to challenge the best of players. 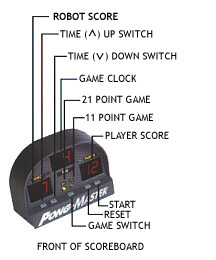 Game Points Switch: Select an easy 11 point game or a harder 21 point game. 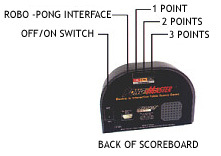 Target Points: Program the scoreboard to award 1, 2, or 3 points for each successful target hit. 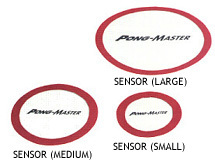 Multiple Sensors: Place 1, 2, or all 3 sensors on the table at one time. Sensors can be Placed Anywhere on the Table: Spread them out for a harder game or group them together for an easier game. Robo-Pong 2040/2050 fires up to 90 balls per minute across the net with different spins. But simply returning the ball isn't enough to take down this challenger. Your return must hit one of the Pong-Master sensor targets on Robo-Pong 2040/2050's side of the net to earn points. While Robo-Pong 2040/2050 gets another point every few seconds, you're racing against the clock and the robot all the way. You select the amount of time you have to beat the robot. Pong-Master keeps the time and score electronically on an LED readout to let you know where you stand. And it keeps the pressure on you. Beat Robo-Pong 2040/2050 at Pong-master and you can beat anybody. 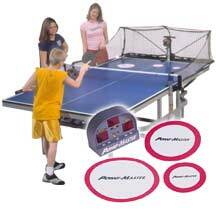 You control the tempo of the game by presetting Robo-Pong 2040/2050 for the desired skill level. Put the same spin and landing point on every shot, or use the oscillator to spread shots randomly. Select a low, fast shot for a challenging game or a high, slow shot for an easier game. You score points every time you hit a target. Pong-Master and Robo-Pong 2040/2050 provide a real Ping Pong workout that can entertain for hours while putting everyone on the path to health and fitness. Actually increases skill and accuracy while playing. Everyone in the family will love the excitement of this fast moving game so much that the biggest challenge you'll face is getting you turn with Pong-Master. Take the challenge and see how your family's skills measure up to the ultimate competition the ultimate Ping Pong game. POWER SOURCE: Approved 12V transformers available for most 120 or 240 volt outlets. TRANSFORMER: 12 VAC, 400 MA. GAME TIME: Adjustable from 1 minute to 10 minutes. GAME LENGTH: 21 point game or 11 point game. NUMBER OF TARGETS: 3; can use 1, 2, or all 3 targets at one time. SIZE TARGETS: 1 each 4", 6", and 10" round. SCOREBOARD: Features easy to read, bright red LED readouts. TARGET SCORE: Each target may be programmed to score 1, 2, or 3 points for each hit. NOTE: This game requires a Newgy 2040 or 2050 robot. Note: For Australia only. No express post service, via regular mail only.